Jose Canseco was born on Thursday, July 2, 1964, in Havana, Cuba. 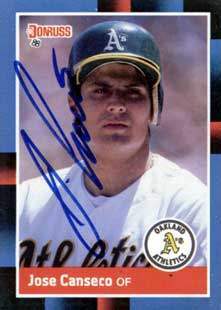 Canseco was 21 years old when he broke into the big leagues on September 2, 1985, with the Oakland Athletics. His biographical data, year-by-year hitting stats, fielding stats, pitching stats (where applicable), career totals, uniform numbers, salary data and miscellaneous items-of-interest are presented by Baseball Almanac on this comprehensive Jose Canseco baseball stats page. Did you know that Jose Canseco (1988), Barry Bonds (1996), Alex Rodriguez (1998) and Alfonso Soriano (2006) are the only four Major League ballplayers in the 40/40 Club ? Canseco was the first ballplayer in Major League history to accomplish the feat, thus he started the 40/40 Club , which is elite group of slugger who have connected for at least forty home runs yet were still fast enough to steal at least forty bases during the same season. When Soriano joined the club his manager, hall of famer Frank Robinson , commented on MLB.com, "It's a very nice accomplishment. There's no doubt about it. The people that hit forty home runs or more don't steal that many bases, even today. It's quite an accomplishment." and his opponent's manager, Ned Yost of the Brewers , commented, "You don't see 40-40 every day, and that's a huge accomplishment." 1986 - Jose Canseco won the 1986 Rookie of the Year Award , the first for the Oakland Athletics (in franchise history Harry Byrd had won in 1952 as a member of the Philadelphia Athletics ). 1987 - Jose Canseco hit 31 home runs in 1987, Mark McGwire joined the team that year and hit 49 home runs, the "Bash Brothers" moniker was attached to the fearsome offensive duo (see poster above). 1988 - Jose Canseco, on his way to "creating" the 40/40 Club , joined the 30 / 30 Club in 1988 first, the first player in Athletics history with at least 30 home runs and 30 stolen bases in the same season. 1991 - Jose Canseco captured his third Silver Slugger Award in Oakland , the most by an Athletics outfielder, passing two-time (wth A's ) recipient Rickey Henderson . 1993 - Jose Canseco had a couple of historic moments during the 1993 season including the Carlos Martinez fly ball that bounced off Canseco's head on May 26, 1993 , then three days later his appearance on the mound as a pitcher, May 29, 1993 , 33 pitches, twelve strikes, three walks, two hits, three earned runs - and shortly thereafter, Tommy John Surgery which cost him (and his team) the rest of the season. 1996 - Jose Canseco reached the 1,000 RBI plateau in 1996, during his 1,298th game played, fewer games than anyone since Ted Williams . 2001 - Jose Canseco finished his career with 462 home runs, the most by any Latin born player in Major League history - since passed by Carlos Delgado (473), Rafael Palmeiro (569), Manny Ramirez (555), Alex Rodriguez (Active), and Sammy Sosa (609). 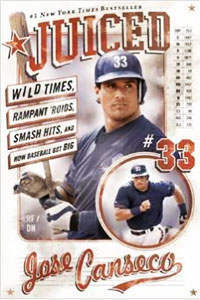 2005 - Jose Canseco had his tell-all book, Juiced: Wild Times, Rampant 'Roids, Smash Hits & How Baseball Got Big , published in 2005, setting off a hail storm due to his specific details about steroid use in the Major Leagues. Canseco stated that approximately 85% of Major League players used steroids and he specifically identified former teammates Jason Giambi , Juan Gonzalez , Mark McGwire , Rafael Palmeiro and Ivan Rodriguez . So all of a sudden ballparks were being built with brand-new, high-tech weight-lifting facilities, and at the older ballparks they were moving stuff around and remodeling to make room for weight rooms. I definitely restructured the way the game was played. Because of my influence, and my example, there were dramatic changes in the way that players looked and the way they played. That was because of changes in their nutrition, their approach to fitness and weight lifting, and their steroid intake and education. If you asked any player who was the one who knew about steroids, theyd all tell you: Jose Canseco. Who do you go to when you want information on steroids? Who do you go to if you wanted to know if you were using it properly? If you picked up this book just for a few juicy tales about which players Ive poked with needles full of steroids, or what it was like when Madonna sat on my lap and asked me to kiss her, thats fine with me. Ive lived a colorful life, and people have always been curious about the things Ive done. If you want to flip through the chapters looking for the highlights, I have no problem with that (as long as you pay the cover price, of course). But let me be clear that Im writing this book for people who are ready to think for themselves. Thats all Im asking. Hear me out, listen to what I have to say about baseball and other things, and come to your own conclusions. That might sound easy, but believe me, coming to terms with a true picture of what has been going on in baseball in the past ten years or so might not be what you really want. Do I expect some skepticism from people? Of course I do. Ive made some mistakes in the past. Ive made mistakes in my personal life, and Ive made mistakes in public, too. There have been times when I spoke out without realizing how my comments might sound to people. Thats all water under the bridge. Now, Im looking to the rest of my life, not dwelling on what might have been. Im telling the truth about steroids in this book because someone has to do it. Were long overdue for some honesty and, as any ballplayer will tell you, I know the real story of steroids in baseball better than any man alive. Im also in a position to tell you the truth because I no longer have any ties with Major League Baseball, and I have no interest in the politics and double standards of Major League Baseball. Im my own man and always have been." 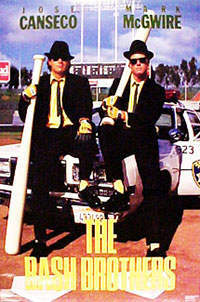 Excerpt: Juiced: Wild Times, Rampant 'Roids, Smash Hits & How Baseball Got Big , by Jose Canseco. All rights reserved. Used with permission from HarperCollins Publishers, 10 East 53rd Street, New York, NY 10022.